According to the Temperate Forest Foundation, wood is 16 times more efficient as an insulator than concrete, 415 times as efficient as steel and 2,000 times as efficient as aluminum. Click here to learn more! Never paint or stain your interior doors again! Maintenance free and eco-friendly! Click here to learn more! 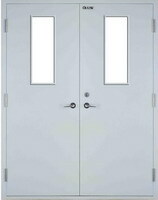 Top-quality fireproof doors and frames to meet the needs of the real estate and construction industries. Click here to learn more!